PLEASE NOTE - you are bidding on original 1960s vinyl - this will not have completely silent surfaces, even when in unplayed condition - but the sound and recording quality is generally excellent. If you are looking for absolutely perfect blemish-free reproduction, please bear this in mind. 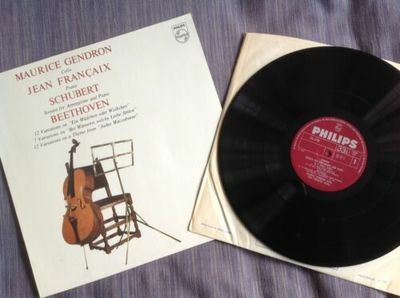 UK Philips stereo LP SAL 3746 (802 805 LY), issued 1966 Schubert Arpeggione Sonata in A minor D. 821 and Beethoven 3 sets of Variations for cello and piano (see photos for details) Played by Maurice Gendron (cello) and Jean Francaix (piano) Vinyl looks NM, good gloss, looks unplayed. Fully play-tested overall EX to NM. Excellent sound quality, with some light ticks and "static" background occasionally, mainly on first few grooves on each side. No wear and no distortion. Maroon first issue labels NM, no spindle trails visible. Condition of sleeve is NM (all intact, very crisp and clean, glossy surfaces, back very clean and unmarked, effectively as new - see photos). I will combine postage for multiple items, please contact me if you are intending to bid on further LPs. Payment please within seven days of auction ending; foreign bidders please wait for invoice. These LPs are all from my personal collection, which has grown much too large, and so I am thinning down, as I won't be able to listen to all of them in one lifetime. I will be putting up for auction mainly classical LPs from the advent of LP in the early 1950s until the 1980s, but principally early stereos (late 50s and 60s), rare repertoire, and often first or early pressings. There will also be some 1960s-80s rock, pop, blues and jazz. The description will state if the LPs have been fully auditioned (for rarer material, or when the visual grading is unclear),spot-auditioned, or if not otherwise stated, just visually graded. A few LPs will have been professionally cleaned, and this will be stated in the description. In my experience, most used LPs will benefit from professional cleaning which reduces background surface noise and often removes many of the pops and clicks, especially when these are due to debris, grease etc on the surface. GRADING (obviously slightly subjective and often dependent on original pressing and vinyl quality) - see description of each LP for more detail. Mint Only used for sealed and unopened records (which may of course have pressing defects which are not visible until unsealed). NM Visually perfect, no scuffs or other marks, and plays without any problems, and barely audible surface noise (depending on date and pressing). No spindle trails on label. Jacket (sleeve) or box will be almost perfect. EX Only one or two very minor marks that might give the occasional low level pop or click but no serious scuffs or scratches and the record should play without any distortion or serious problems. Surface noise may be slightly more apparent than NM but still not at all distracting. Jacket or box may have some minor defects, slight distortions or edge knocks, small amount of discolouration or slight laminate peel etc. VG+ Minor surface marks that will give occasional background noise or a few repeating click and pops for a short period, or more noticeable surface noise, but on the whole the record should play without serious problems, and will still be enjoyable to listen to. Sleeve or box may have noticeable defects (laminate peel or loss, small edge splits or repaired tears, staining or discoloration, slight sticker damage etc), but no major tears, losses, or bends. VG: There are marks that will cause some deterioration in the sound, such as repeating clicks from shallow scratches, or higher levels of background noise but this will not be serious enough to cause a major distraction to the listener. Very slight inner groove or "side-end" distortion may be present on loud passages. Sleeve or box might have splits (repaired or otherwise), pronounced ring-wear, tears, sticker damage, writing,or noticeable creases or bends. Only very rare records will be offered for sale in less than VG condition; the description will give details of all the defects in such cases. Additional insurance can be purchased, please ask for a quote. · Larger quantities, please ask for a quote. · Boxed sets - the box generally adds the weight of one extra LP. Please remember that earlier pressings will usually weigh more than later ones (some early mono LPs are more than 200g). · For all packages insurance is required and I can provide a quote for higher value packages (over £250). I will always retain proof of postage. · LPs will be well packed, double-boxed if needed, with extra stiffeners, and with the LP removed from the outer sleeve to prevent seam splits.